We arrived in Madrid at 10:20 - Madrid time—4:20 am our time. Having spent so much time in the Madrid airport last year – six hours going and coming, we knew our way around. We rode the train to the main terminal, retrieved our luggage and hailed a taxi. The driver didn’t have anything to say but knew where our hotel was. We checked in the Hotel Agumar. This is same hotel for the beginning of the tour. We originally had asked Globus to rent us a room for the first night. We planned on arriving a day before the actual tour began in order to rest from the flight. Globus wanted $300, but we were able to get the same room for $78.00. With the recession, travel seems to be off and there are bargains. Globus had bought the rooms a year ago. Our room was small with twin beds. We were really tired but we decided to go for a walk. Atchoa, the big train station was five block away. This is the same train station where the terrorist bombing took place several years ago. We wanted to pay our respect to those who died as well as to check it out because this is where we were to catch the train when we went back to Barcelona at the end of the tour. We walked back to the hotel and slept seriously from 1-5pm. We woke up rather groggy and not ready to play, so we unpacked. Then we planned on how to get to Plaza Puerto del Sol on the Metro. It was a straight shot, and we did it easily with just some confusion over the tickets. Plaza Puerto del Sol was sort of disappointing and the entire center was closed up due to some road or plaza construction. 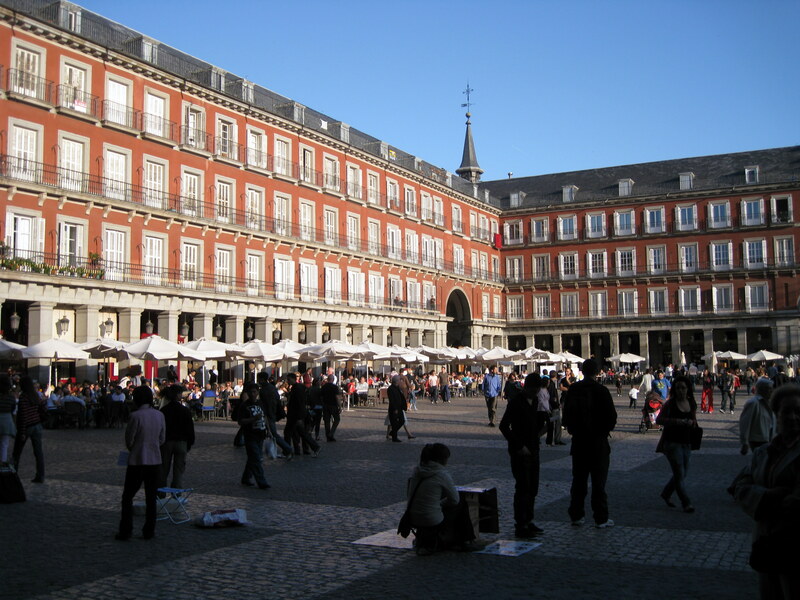 This is the center of Madrid’s historic center, it used to be on the eastern border of the city. The plaza's name originates from the eastern city gate located here in the 15th century. The gate was probably called after a sun drawn on it, hence the name Puerta del Sol or 'Sun Gate'. 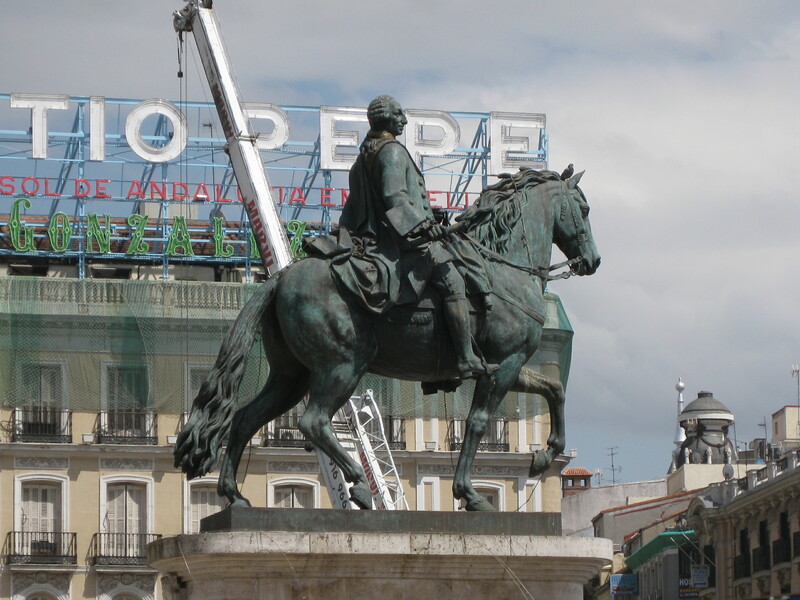 In the middle of the square is a large equestrian statue of King Carlos III. The King looks out to a beautiful 18th century red brick building, the former main post office. 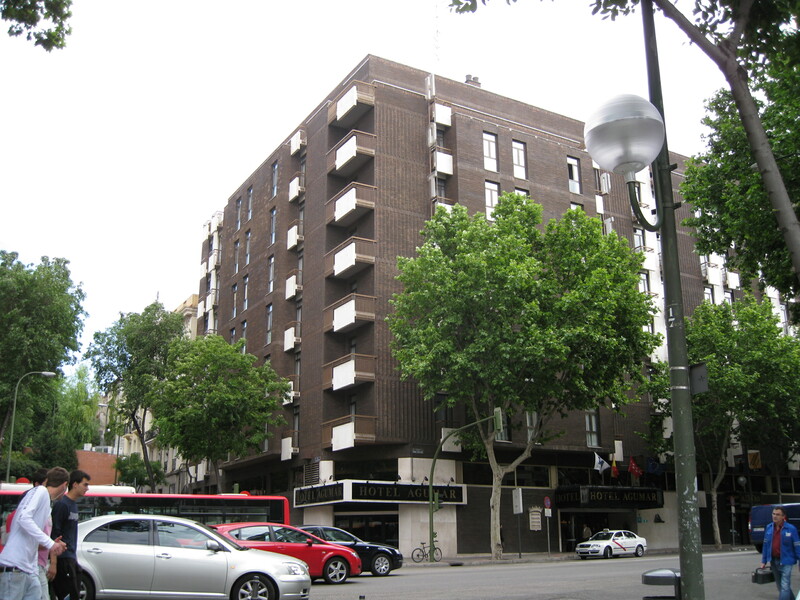 In front of this building on the pavement is the 'kilometer 0' plaque, marking the center of the Spanish road network. It is the starting point from where all the highway distances are measured. 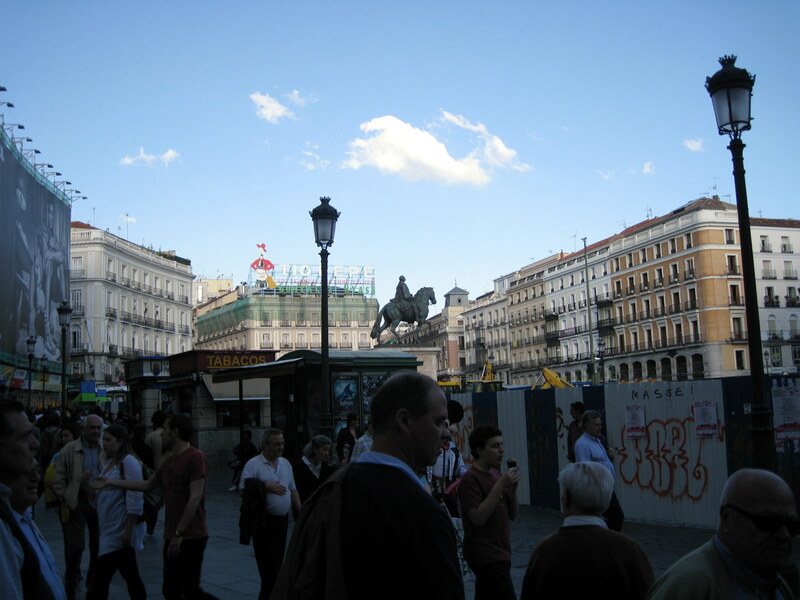 The Puerta del Sol is also the location of the symbol of Madrid: a 20 ton statue of a bear eating fruits from a tree. The official name of the statue is 'El Oso y El Madroño'. The Madroño is a tree related to the strawberry tree. The area was very busy with a lot of residents – both young and old. We stopped in a church where mass was going on, but didn’t stay. The church was packed. 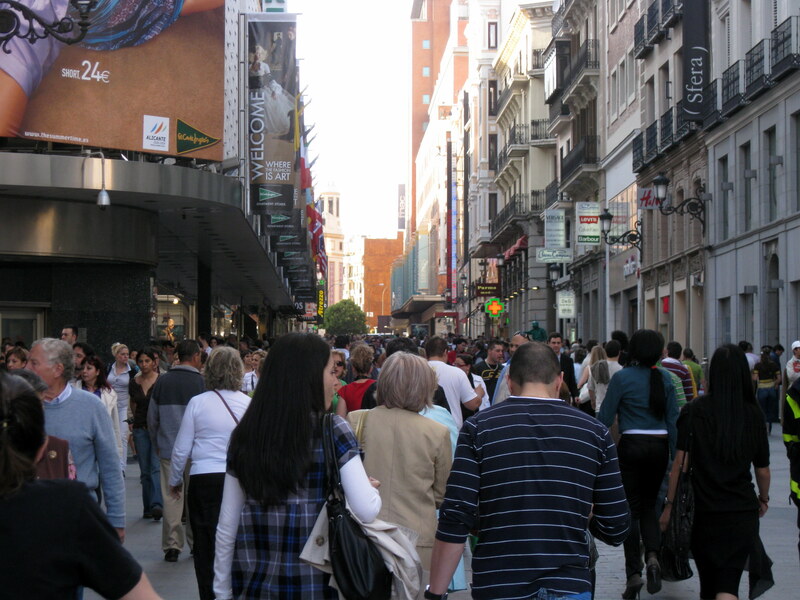 Then we walked to the Plaza Major just a few blocks away. This was much bigger with large buildings on the four sides. This square was known as the Plaza de Arrabal during medieval times, when it stood outside the city wall. Under the Habsburgs, the square rose in importance as the site of public spectacles, including the abominable autos de fe, in which heretics were burned. 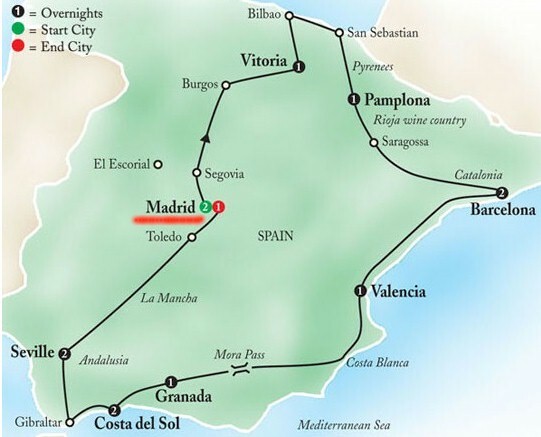 Bullfights, knightly tournaments, and festivals were also staged here. There are a number of outdoor cafes around the area, each featuring the menu and waiter trying to bring in the tourists. We knew that these cafes were expensive and the food wasn’t as good as some of the restaurants on the side streets; however, we did choose one, Restaurant Hagar. I asked my wife to order me a Jack Daniels while I went to the restroom. When I got back I had about three fourths of a glass of straight bourbon on ice. She said that the man came with the bottle and started pouring. He would have poured the glass full if she hadn’t stopped him. We found all through Spain that this was the custom---just bring the bottle and pour until you stopped him. My wife had white wine. For a starter we had asparagus (spargle) with two sauces, sounds fancy - one “sauce” was mayonnaise! I had a salmon and she had Hake. Both were very good. They serve bread and butter and if you eat it, and once it’s on the table, it costs two euros each. This was the beginning of my wife’s love affair with Spanish bread; she ate the bread that night, and ever after. 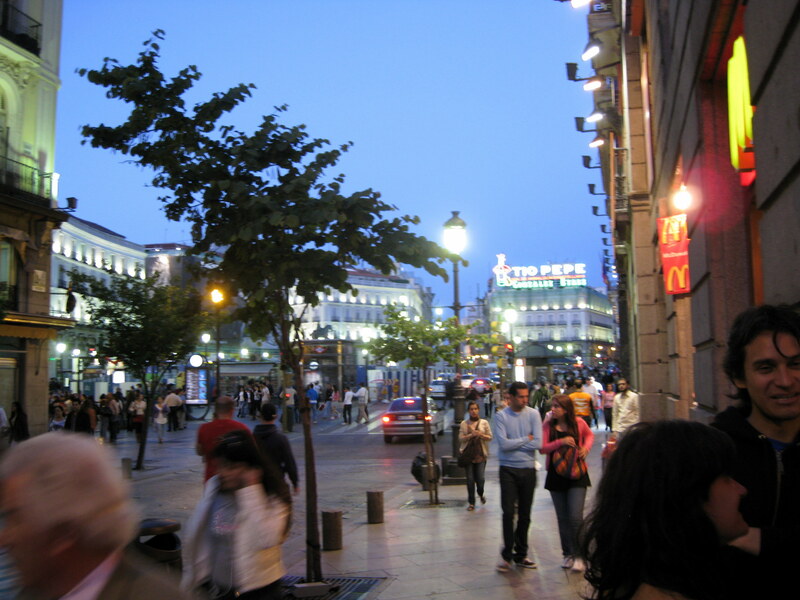 After dinner we walked around some more (note McDonald's in photo on the right- Puerta del Sol) and then took the Metro back to the station near our hotel. Our hotel neighborhood is not historic and is a bit depressing. 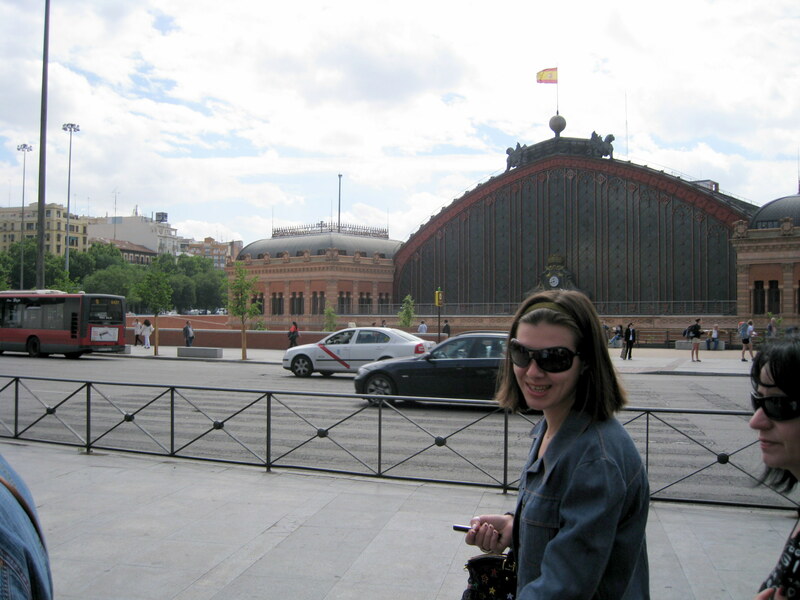 We feel better having seen the historic sites and that we were able to successfully manage the metro in Madrid.